Just finished restoring a HMV P17BX export version of the local UK set. Valve line up is 1R5, 1T4, 1S5 and 3S4. A solid performing set very clear. Purchased at auction for $100.00 in 2013. Not made by the Marconi Company. 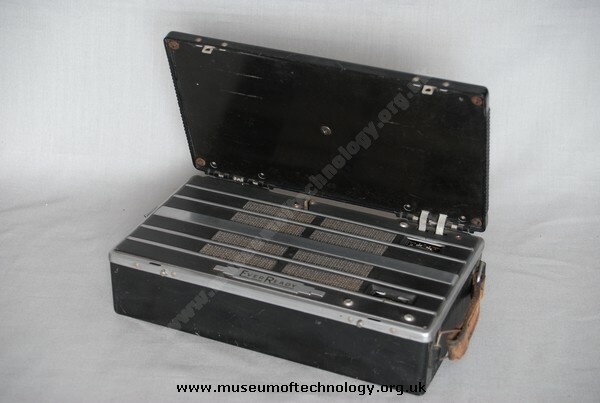 Its Marconiphone and G Marconi brands were sold to The Gramophone Company in 1929. The 1947 Model B seems to be the Marconiphone/HMV chassis based on original RCA "e;Personal BP10" design of 1940 (the tubes developed in 1939), likely why no LW as USA never had LW Radio. Over 250,000 BP10 sold before Pearl Harbour, also about 10 other US brands with "e;Personal"e;sets. In 1948 Ever Ready brought out the "e;Personal B2"e; which is almost identical but adds LW. Marconiphone/HMV was basically the USA RCA in UK. It never ceases to amaze me that these miniature wireless sets were produced in the 1940's and yet 10 years later the industry went back to those horrible great suitcases made by Ferranti,Bush and the others.As far as performance goes my Marconiphone P17B works fine and sounds better than many a modern trannie,[the radio type! ],I make up a combined HT/LT battery from 10 x PP3's+1"C" cell in a reproduced correct size battery box.There was room to add the few cmponants needed for Long Wave so it's a mystery why it was never done.Mine is in weekly if not daily use with ALL it's original components.I wonder if we could say that about those MP3 things or CD &DVD players that seem to give up the ghost after a couple of years,I don't think so!